Hogue recoil pads are manufactured with an exclusive base plate material that is super-rigid and grinds easily without the cracking and checking problems that are so common with other inferior brands. Because our base plate is so strong, no wire or metal reinforcing is required, reducing the chance of delamination. The rigidity of the plate makes for a nice, tight fit to the stock without gaps caused by bending and warping. Bonded to the base plate is a modern super-soft elastomer that grinds easily and finishes cleanly. Hogue recoils pads are available as pre-ground or grind to fit. 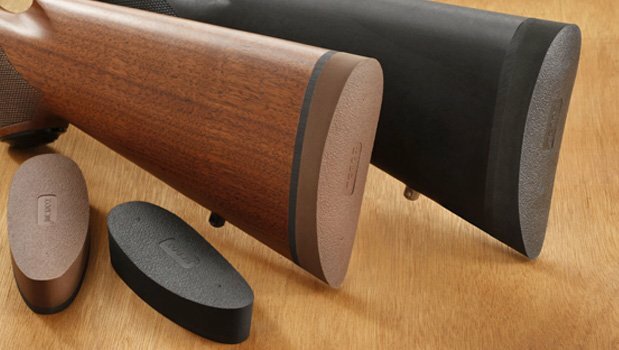 The Hogue pre-ground pads are prepared to fit most standard and popular rifles and shotguns. Our grind-to-fit pads are available in small, medium and large sizes. All Hogue pads are available in either black or brown.